This is pretty interesting and amusing on a couple of levels. The Imperial name was first used in the mid-1920s. It was Chrysler's top of the line model. Throughout it's life the Imperial featured Chrysler's latest and greatest in technology. In 1934 Chrysler used it to introduce the Airflow design, which, while a sales failure in its day, is considered to be one of the most advanced cars of its time. In 1955 Chrysler made Imperial a separate brand, designed to compete with Cadillac and Lincoln. Imperials were titled as Imperials, not Chryslers. They blundered, in my opinion, by not setting up separate Imperial showrooms. 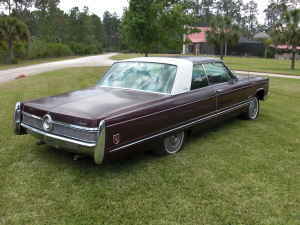 Imperials were sold in Chrysler showrooms, side by side with more mundane Chrysler models. This is a "Mobile Director" Coupe. The "Mobile Director" option had a front passenger seat that turned fully rearward. There was a table and light in the backseat area. The idea was that an executive - while being driven to work - could turn around and do work or sit behind the driver and give dictation to a secretary. The Mobile Director option is rare. It was only offered on the coupe, as the B-pillar would have been in the way of the swiveling seat on a 4 door. That was part of the sales problem. In the 1960s, executives who were driven to work wanted to be seen in a huge 4 door limo, not a huge 2 door coupe. It's interesting and amusing to look at this car. First of all, there's the safety factor. How many execs would use the lap belt while the seat was turned around? (Shoulder belts weren't mandatory in cars in 1967.) I suspect very few. Not to mention that by sitting "backwards" you'd be unable to see an accident about to happen and have any time to brace yourself. Even if you did, what would you grab? The table? The light? The secretary? But, on the interesting side, this car represents a time when US manufacturers actually tried to make their cars unique. Did Lincoln and Cadillac have a coupe with a swiveling seat, a table and a light? Nope. If you found this idea appealing and/or necessary you had to buy an Imperial. It was unique to the Imperial. The Mobile Director option was hoaky as hell. In reality is was pretty useless. Still, the fact that Chrysler offered it showed a level of competitive thinking that has been lost by US car manufacturers today. This car is located in Daytona Beach, FL. It needs restoration. Click here to see the Craigslist listing. It should be noted that a few websites have mentioned that there are a few "bootleg" Mobile Director coupes out there. If having a real one means a lot to you, it would be worthwhile to find paperwork on the one you're considering. The "Imperial Web Pages" has some more info and some great pictures. You can find it here. While I really like Imperials, I generally draw the line around the 1966 model year. The 1967's, like the cited Mobile Meth Lab model, appear to me like badge engineered Chryslers. It's kind of a dismal fate really. The earlier Exner and Engel designs were classic. The Italian tailored Ghia limousines were far more exclusive than their Cadillac counterparts. The Ghia's for me are still the ultimate "Underworld Bad Guy" car of choice. 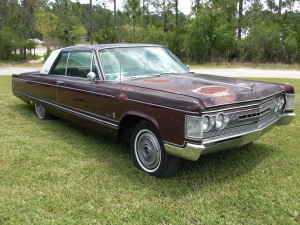 Imperial even chose to use self contained headlights that were mounted on the bumper, up until 1963. This must have cost some bucks. I always considered the pre 1967 models as being wayyyy underpriced. It seemed nobody ever wanted them. Listings often stated, "...perfect as a demo derby car." That black 1964 Crown Coupe from Canada has been on and off ebay for well over a year. I just looked it up. It's still there and it's gorgeous. Then we have this 1967 unibody with the Mobile Ouija Board Option. 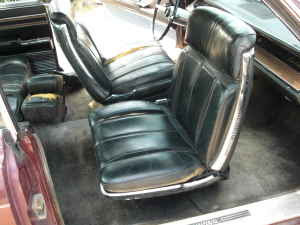 If it wasn't for the cool swivel seat, it would rank right up there with the 1974-76 Fleetwood Talisman.